If you’re tired of the constant upkeep and hassle of unwanted hair, then the experienced team at Avenue Advanced Skin Care can help. At Avenue Advanced Skin Care, we offer a long-term solution to removing unwanted hairs using Palomar StarLux IPL and Fotona Dynamis Laser Hair Removal, which will leave your skin feeling silky and smooth. Based in Melbourne, our skin care clinic has an on-site doctor, giving us access to the latest techniques in a safe environment. We offer the choice between medical grade hair removal technologies of IPL and Laser Hair Removal, enabling us to treat all skin tones safely. Our medical grade technology provides precision, power and safety for superior results, placing us as a leader in IPL and laser hair removal in Melbourne. 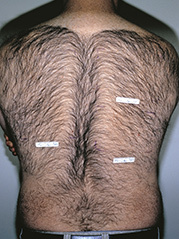 We also offer hair removal using Sterex Electrolysis. Electrolysis is ideal for treating fine, blonde and white hairs on the face and body. Are IPL and laser hair removal safe? Our dermal therapists undergo in-depth laser safety training to ensure very safe and effective treatments, and to prevent discomfort and irritation by giving you appropriate pre and post-care advice. Our advanced, high-powered equipment will provide excellent results with fewer treatments; unlike low-quality systems which often require numerous sessions. Most patients require minimum of 6 treatments to see long term results, but will see a huge clearance of hair even after the first couple of sessions. Prior to an IPL or a Laser Hair Removal treatment, please avoid waxing, plucking, or threading the area for 4 weeks. Also avoid sun exposure, use of self-tanners (including spray tans) or solariums prior to the treatment. Please note – if you are currently taking a light sensitizing medication we may have to wait until you have finished before you can be treated. As well as being a long-term hair removal solution, IPL and Laser Hair Removal provide targeted relief and treatment for ingrown hairs. Our treatments destroy the hair follicle, meaning existing ingrown hairs are removed, and future occurrences are prevented entirely. Treatments are performed by our experienced team of dermal therapists and the length of a session can last between a few minutes up to an hour, depending on the size of the area being treated. Most clients tolerate the procedure with minimal discomfort, but for those with a low pain threshold, we can apply ice or cold air to the area post treatment. The after-effects vary from one person to another, they are generally minor but we recommend that you avoid sun exposure of heated activities for at least 48hours. We offer the choice between IPL and Laser Hair Removal, allowing us to target a number of problem areas. Our advanced technologies can treat many areas including the back, abdomen, bikini area, arms, legs, as well as many other areas. We can effectively and safely target unwanted facial hair growth for a longer lasting solution. IPL and Laser Hair Removal can treat facial areas of the upper lip, chin, cheeks, hairline, nostrils, earlobes and between the eyebrows. The Palomar StarLux system removes unwanted hair by delivering a pulse of intense light directly to the hair follicles. This interrupts the blood supply to the hair and disables the cells responsible for growing new hair. Stomach. Results may vary from patient to patient. 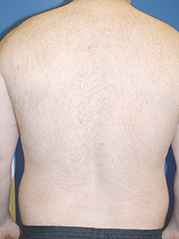 Back.Results may vary from patient to patient. Underarms. Results may vary from patient to patient. The Fotona Dynamis Laser incorporates pulse-control technology and a three-dimensional treatment pattern to achieve significant, long-lasting results. Its high peak-power laser pulses provide speed and comfort for quick and safe treatments. This treatment is ideal for darker skin types. The Sterex Electrolysis system is the ideal long term hair removal solution for treating fine, blonde and white hairs on the face and body. This medical electrolysis device targets the growth center of the hair with heat energy using a very fine probe that is inserted into the hair follicle.